Mechanical-biological waste treatment (MBT) is an efficient and comparatively cheap way to recycle components of the residual waste and to reduce organic input into landfill. In Germany more than 50 MBT plants with an annual treatment capacity of more than 5,600,000 t per year are in operation. In Austria and Italy MBT is also a wide spread technique and it is going to become a very important waste management option in many other countries. In a time of strongly increasing demand for material resources, extraction of recyclable materials from waste is becoming more and more important. The International Symposium MBT focuses on MBT and additionally on automatic waste sorting technology as the bridge between waste management and recycling industry. Having participants from 31 countries, the bilingual International Symposium MBT 2005 became the internationally most recognised conference on MBT. 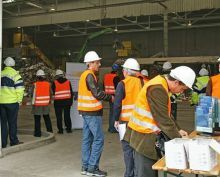 By extending the conference by two additional languages and by including automatic waste sorting technology the International Symposium MBT 2007 will expand its position.